We rang in the new year with a giant feast at my parents' house. On the menu: King crab, steak, prawns, clam chowder, crusty bread, and jello salad. Not a veggie to be seen, ahem. The lack of green food was a total oversight but I decided to think of our meal as a symbol of our coming prosperity in 2011. This may or may not be because of the books I've been reading about ancient China. 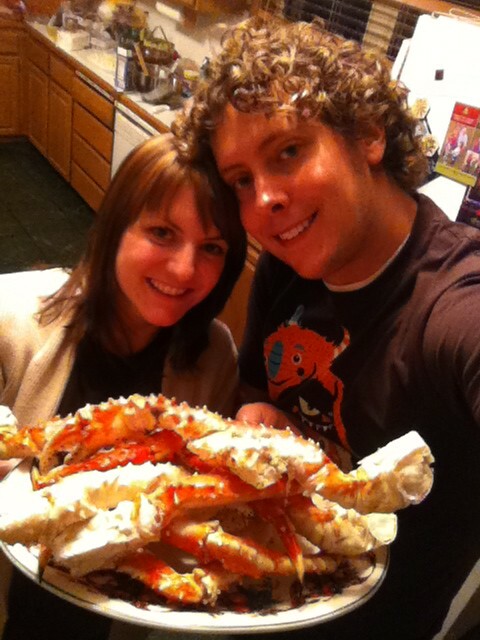 With three years under our belts, I'm officially declaring Crab-Crackin' New Year a Walker family tradition. It may take me a while to get back into the swing of blogging. I hope you'll be patient with me. Thoughts of resolutions and the new year have been making me melancholy and quiet. But there are plenty of things to talk about on this space and I'll get there eventually. I have a new header to make and house pictures to post. Plus, I've missed you. I'll be back in the swing of things soon, I promise. Sounds like the perfect tradition to me! You look absolutely adorable in that picture! I am all for starting new traditions. Wishing you and your family a happy, healthy and prosperous 2011 Miranda! cannot wait to see the new header and pictures of the new house! Food sounds delicious - even without something green. Jello counts as a fruit right ;) so you have your fiber there. I am so getting on that band wagon! Looks so dang yummy, and who needs veggies when you have king crab? I can't wait to see the house, love ya!